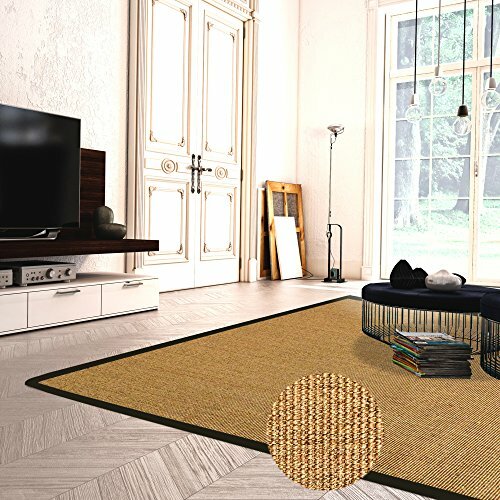 Inspired by coastal living, this Contemporary Sisal Interior Area Rug, made of 100% Natural Sisal combines a natural feel with the elegance of a luxury carpet. This Sisal rug looks great under with any furniture in a living room or bedroom. Bring a natural feel of mother's nature to any of your home interiors with your choice of Bristol's neutral tones. • Cleaning & Care: Vacuum regularly, without the use of a rotary brush. Blot spills immediately with a dry cloth, professionally clean annually. (Please note Natural Sisal rugs are recommended for indoor use only. Moisture will stain Sisal rugs; therefore, damp environments (kitchens, baths, and basements) are not recommended). 100% NATURAL SISAL area rug with a wide selection of cotton borders to choose from GREAT FOR HIGH TRAFFIC AREAS, Sisal material fibers have a rope like texture adding strength and durability to this rug. COMFORTABLE UNDERFOOT NEUTRAL COLOR blends well with a wide range of furniture colors and styles ALL NATURAL FIBERS - The fiber is machine woven into a boucle weave pattern that is highly durable, sound-absorbing and anti-static.